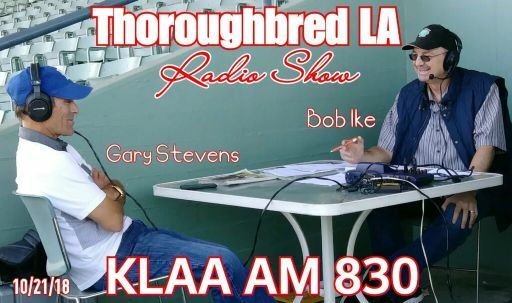 Broadcast Saturday mornings from 9:00 - 10:00 and Sunday mornings from 8:00 - 10:00 AM Pacific time on AM 830 KLAA, Thoroughbred Los Angeles covers the Southern California racing scene from the starting gate to finish line. Hosts Jay Privman and Mike Willman provide interviews, previews, handicapping information and insights into the Sport of Kings. Tune in every weekend to get up-to-date on all the latest local and national thoroughbred racing happenings, and get the information you need before going to the mutuel windows. As the National Correspondent for Daily Racing Form, and commentator on NBC's thoroughbred racing coverage, Saturday host Jay Privman brings years of experience to the Thoroughbred Los Angeles microphone. Get ready for a fast paced hour, as Jay's guests include handicappers Bob Ike, Jon Lindo, Bob Mieszerski, Toby Callet, Steve Fierro, and Lauren Stich. Get the latest from Los Alamitos with Ed Burgart, and find out what's happening in Las Vegas with Patrick McQuiggan. Santa Anita Park Publicity Director Mike Willman is joined by HRTV/TVG Host Kurt Hoover for the Sunday edition of Thoroughbred Los Angeles. The Sunday edition features interviews with top Trainers, Jockeys, Agents, and Owners. Each week handicappers Jon Hardoon(from the Ragozin Sheets), Bruce Finkelstein, Aaron Hesz, Patrick McQuiggan and clocker Toby Turrell provide selections. Ed Burgart from Los Alamitos visits every Sunday to recap the Saturday night Quarter Horse action and provide a selection for the Sunday card. And don't miss the "CTBA Play of the Day" sponsored by the California Thoroughbred Breeders Association. Copyright (c) 2019 THOROUGHBREDLA.com. All rights reserved. Design by Free CSS Templates.